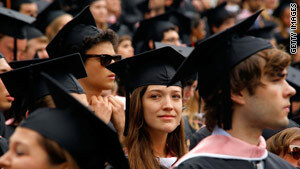 One-third of employers plan to offer new grads salaries of less than $30,000, according to a survey. (CareerBuilder.com) -- Between May and June, on college campuses throughout the country, you can sense a level of excitement that is usually reserved for $1 beer night or when parents finally drive away after a weekend visit. That excitement comes from graduation and the fact that students (at least for a few months) are done with exams, papers, lectures and studying. Perhaps forever or at least until grad school, these students are rid of the pesky academic portion of college and can now embrace the freedom of adulthood, also referred to as the "Real World." Because life is cruel, reality sometimes smacks students across the face with the reality that freedom, glorious freedom is filled with annoyances. Namely, the competition to land a job after graduation. Some students have jobs lined up during their senior year so graduation is one last stop before getting bigger, better paychecks. However, many students are faced with a competitive job market. They've spent years learning their crafts and now they have a diploma -- they just need the paycheck. Who's going to hire them? Video: Students choosing price over prestige? According to a recent CareerBuilder survey, 44 percent of employers intend to hire recent college graduates. Last year 43 percent of employers said the same thing, so at least the number didn't decrease. However, just a few years ago in 2007, a record high of 79 percent of employers said so. That said, of the employers who will be hiring new graduates, 21 percent intend to hire more students than they did last year. Plus, 16 percent will offer higher starting salaries than they did in 2009. This year's grads will definitely compete for jobs in a way that previous classes didn't, but employers are at least approaching the hiring season with more attractive intentions than they did last year. And according to NACE, the National Association of Colleges and Employers, for the first time in this academic year, college hiring is up. The bottom line? Celebrate, graduates! You've worked hard AND your chances of landing a job are better than they've been for years. The survey was conducted from February 10 to March 2, 2010, among 2,778 hiring managers and human resource professionals.